All corals have the ability to reproduce sexually, by producing male and female gametes for fertilisation and subsequent development of large numbers of ciliated larvae known as planula larvae (or planulae), which settle on the reef surface, transform into individual polyps and begin to lay down skeleton. The coral colony is then formed by division of this founder polyp. Individual polyps in a colony may all be male or female (the gonochoric or dioecious condition) or both sexes can be developed within each polyp (hermaphroditic or monoecious condition). There are two very different modes of production of larvae, usually characteristic of a genus or family. 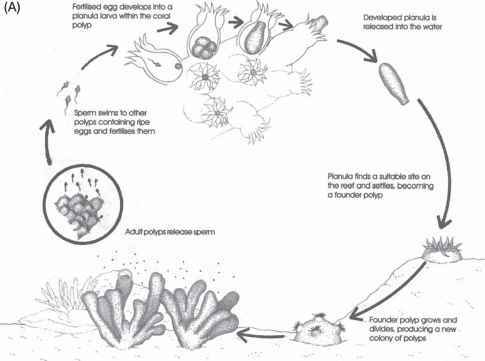 Sperm may be released by the polyps of one colony to find their way into the body cavity of other colonies, where eggs are fertilised and develop in or on the polyps (Fig. 20.3A). This is the brooding condition, with corals having this life cycle being referred to as 'brooders'; until the 1980s, this was thought to be the only type of life cycle in corals (see Box 20.1). In an alternative life cycle, shown by corals referred to as 'broadcast spawners', eggs and sperm are released into the water column for external fertilisation and development (Fig. 20.3B). Since gametes from same colonies do not usually self-fertilise, this second mode requires many colonies of the same species to release gametes at the same time (see Box 20.1). The larvae of brooding corals are released fully developed and ready to settle on the reef, whereas embryogenesis and development of larvae by broadcast-spawning corals requires a developmental period of up to ten days before the planula is ready to settle. Dispersal of larvae outside the home reef is thus far more likely in broadcasters than brooders. 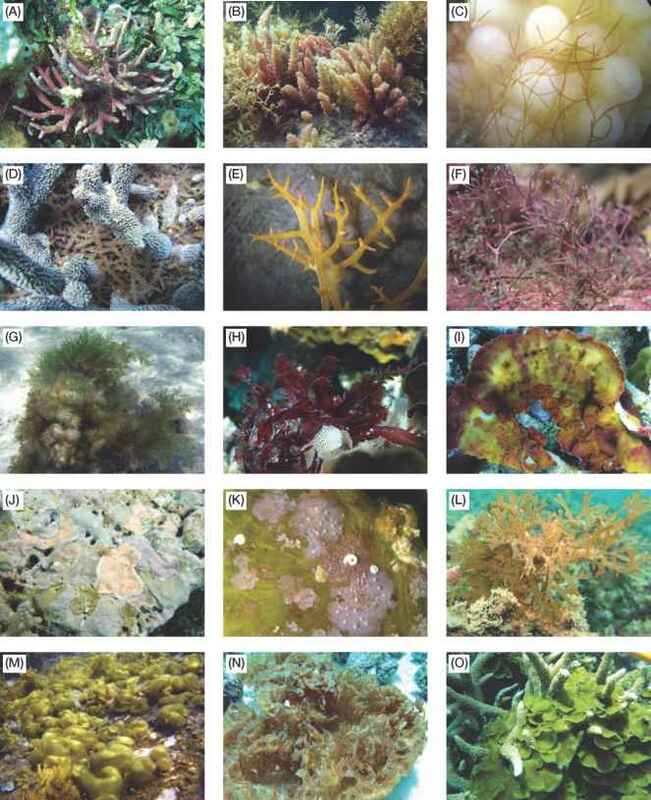 Some corals are also subject to asexual reproduction by breakage and redistribution of branches, formation of polyp balls, and other mechanisms, and this may contribute considerably to population size and biomass.